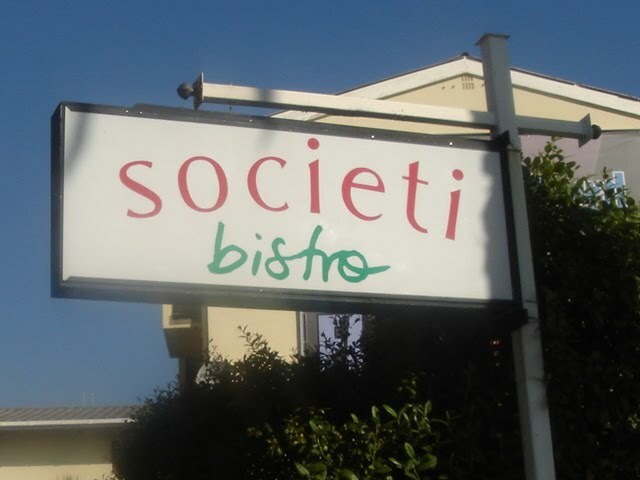 When Societi Bistro moved from the V&A Waterfront to 50 Orange Street, it underwent a complete change of style and personality. A beautiful Edwardian heritage house, superb food, a warm, happy and welcoming atmosphere and voila, the ultimate neighbourhood restaurant was born. 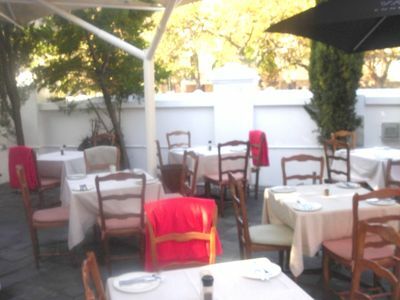 Situated just a few minutes walk away from the arched entrance to the Mount Nelson Hotel and across the road from the University of Cape Town Art School, Societi Bistro's red and green sign beckons. How lovely to walk up to the front door along a narrow path flanked by a guard of honour of carefully trimmed small trees and bushes. On one side there is a patio which on any fine day is abuzz with guests enjoying drinks and meals. The dimly lit interior has the air of an elderly aunt welcoming you into the warm bosom of her home. Walls painted in shades of teal contrast most effectively with plain unplastered brick walls while yellow wood floor boards creak underfoot. An antique cast iron fire place spans two rooms providing warmth and congeniality. Lovely high ceilings and thick outside walls with deep inset windows lend a mellow patina of age. The talented young chef, Stéfan Marais, is passionate and creative. Trained in Europe under French and Italian Chefs, he has acquired skills and techniques from some of the best. Seasonal and regional foods are his special interests. The menu changes with the seasons and the specials, displayed on a blackboard, reflect whatever is fresh from the market on the day. One does not leave hungry from Societi Bistro. The portions are generous and the value is excellent. The service is helpful, intelligent and energetic. Sweet, friendly smiles greet you and I for one really appreciate this. We have all had enough of dour and snooty restaurant personnel. The menu is designed to cater for all tastes and eating preferences. It is absolute heaven for vegetarians and vegans. There are crisp innovative salads which change daily and one certainly does not have to be vegetarian to indulge in all the lovely vegetarian dishes. On one visit I enjoyed a tomato and parmesan tart in puff pastry as a starter. This was a melt in the mouth experience and I can't wait until they put it on the special menu again. 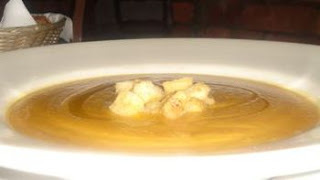 Eugene loves soup and has had a most delicious roasted butternut soup from the special menu. The flavours were intense and the texture like velvet. Another starter on a special menu was Mushroom Arranccini; mushroom risotto moulded around a piece of Mozzarella, then coated with crumbs and deep fried. These were served with rocket and cherry tomatoes. Delicious and perfect for vegetarians. The Mushroom Risotto itself is one of Societi's signature dishes. Order it from the Pasta and Risotto section of the menu. 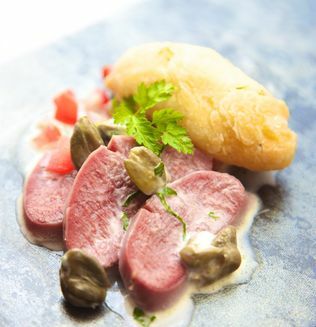 Stéfan does a wonderful Ox Tongue with dauphine potatoes and moutarde sauce. Eugene, the main carnivore in our family, loved this dish and has also tucked into an excellent venison pie topped with curls of the most delicious mashed potato. Try the sirloin with either béarnaise sauce, moutarde or café de Paris butter. A friend of mine polished this off in no time at all. There is a carefully chosen wine list, although you can bring your own and pay a reasonable corkage fee. It is also possible to order all the available wines by the glass. Again as with the food, there is a special menu of wines. These are only available by the bottle. Eugene drank a Peroni beer, whilst my daughter Lexie and I enjoyed glasses of Southern Right and Klein Constantia Sauvignon Blanc. The dessert menu offers delicious options. I was particularly taken by the opportunity to order Artisan Cheese. Artisanal cheeses are a special treat and are served here with homemade preserves and toasts. Societi Bistro is a restaurant of many parts. Apart from the Bistro, there is also the Snug. 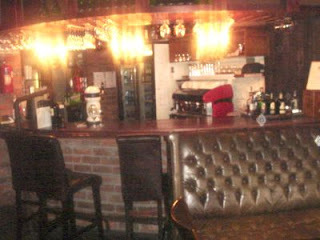 This is a cosy separate room with chairs upholstered in dark leather and with all the accoutrements of a private club. One can hire the whole area for a private cocktail party, or simply sit in front of the fire and enjoy a drink before or after your meal. This is a designated smoking area. Another exciting feature is The Chef's Table. This is a table set in the house kitchen seating from 8 to 22 people. Stéfan consults with you and helps to design a menu and wine selection of your choice. I love the concept of a 'bespoke' menu and of such an innovative way of entertaining. Imagine enjoying a Lucullan feast with plenty of help from Bacchus in the style of a medieval monarch and his court. Kitchen Unconfidential is another aspect of Societi. 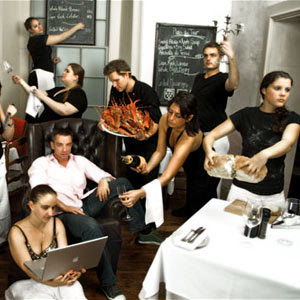 Should you wish to work alongside the professional chefs at Societi, you can arrange to do so. You can discuss the alternatives of a 3 or a 5 day package with Stéfan. You will experience the day to day pressures and protocols of a professional kitchen . Naturally, this presumes a certain level of cooking ability. I imagine that anyone who has seen episodes of Masterchef on the telly would know what to expect. And Societi offers a Chaffeur service! This is so cool. You will be collected and dropped off by a professional chauffeur at exclusive rates from places and at times to suit you. No worries about traffic or parking; drink and eat as much as you like and the price of the service will be added to your lunch bill. I think that they have thought of everything. 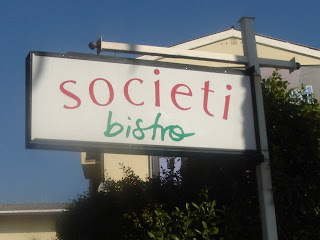 Societi is open from Monday to Saturday for lunch and dinner. The hours are 12 noon to 23h00. Looks heavenly, I can just envision a long lunch on the patio. A glass of wine & Vegan menue would make me happy. Ambiance is very important to me & this place sounds loaded with it. Sadly doubt I will ever make it to South Africa for lunch,but who knows stranger things have happened.